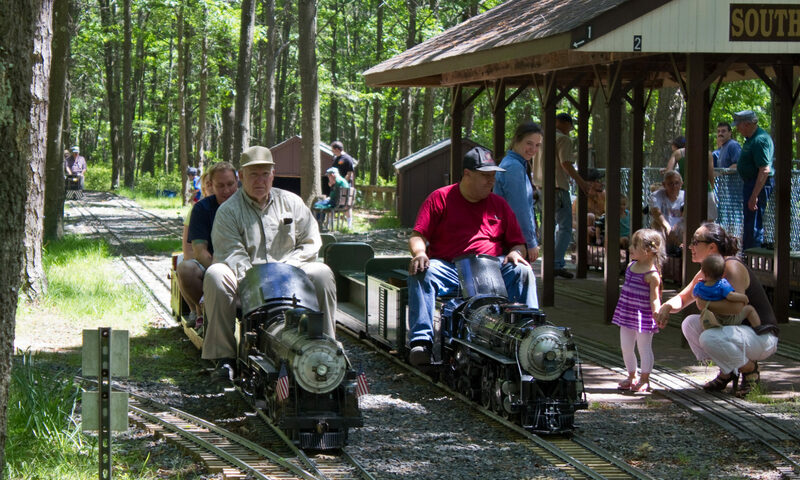 The Long Island Live Steamers track is located in Suffolk’s Southaven County Park. The park is roughly bordered by the Long Island Expressway to the north, Sunrise Highway to the south, William Floyd Parkway to the east, and Gerard Road to the west. Our entrance and parking lot is accessed via Gerard Road. Note that Gerard Road has been dedicated in memory of FDNY Lieutenant Howie Carpluk. Signs at both ends of Gerard Road also read Howie Carpluk Memorial Road. Use Exit 67 (Yaphank Avenue). Turn south on Yaphank Avenue to Gerard Road (second left after bridge over LIRR tracks). Turn left on Gerard Road. Our driveway is approximately 1 mile down on the left and parking is the first right after entering the driveway. Use Exit 58 – William Floyd Parkway North. This exit ramp leads to Victory Avenue. Make a left and continue over William Floyd Parkway. Just past the main entrance for Southaven County Park is Gerard Road (you’ll see our sign on the right). Make a right on Gerard Road. Our entrance is approximately 1/2 mile on the right. Use Exit 57 – Horseblock Road West. The cloverleaf will take you over Sunrise Highway. Just past the westbound entrance to Sunrise is Victory Avenue. Make a right and watch for our sign to your left at Gerard Road. Turn left on Gerard Road. Our entrance is approximately 1/2 mile on the right. Click HERE to jump to Google Maps. You can get detailed driving instructions there and even see our location from a satellite’s point of view. Note that Google Maps shows LILS as north of the shooting range, we are actually just south of it. A correction has been requested. Please look for our sign on Gerard Road.